Continuing in the deluge of new voices emanating from the Sleazy Beats Blog... I'll do the honors in taking my first test drive on the new-review-crew highway. The Silver Rider here, Texas based producer/DJ and known affiliate to the Smokecloud Records and Whiskey Disco camps; it's an honor to step up to the plate for Kris & Guy and hopefully provide you fine readers with something that isnt's complete drivel. Enjoy! When it comes to cosmically drenched, exquisitely executed edits, look no further than Mojo Filter...I myself couldn't be helped when it came to this tasty little 45, available now on Wah Wah Dubplates. This hand-stamped beauty may look low-budget on the surface, but rest assured, both sides are absolutely lovely and see the Filter re-rub some wonderful cuts from Dionne Warwick and Nina Simone. 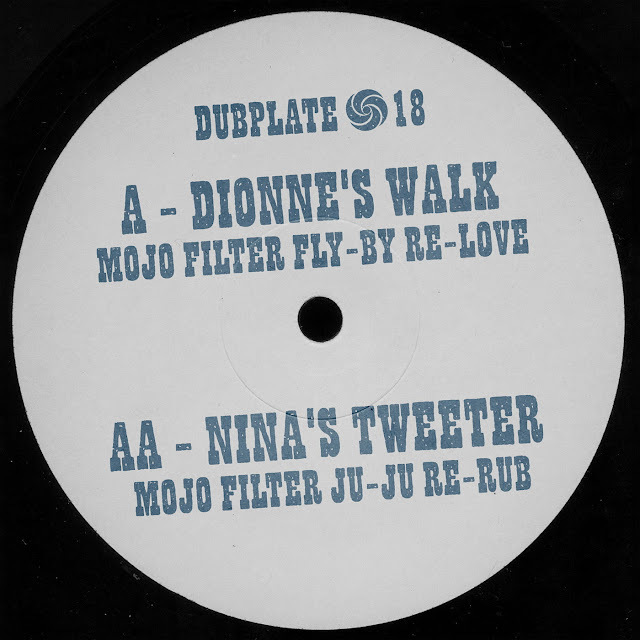 Up first is "Dionne's Walk" which kicks of with syrupy percussion riffs and 'verbed-out string fills before plunging into the sample source and Warwick's cooing vocals. A smooth, disco-stomp is introduced to transform the original from symphonic ballad to hip-shaking stepper with effortless class. On the flip, a psychedelic funk gem gets mined from the depths of a mid-70's album and "Nina's Tweeter" bursts from the grooves with heavy percussion and vicious rhymes spit from The High Priestess of Soul herself. Steel drums melodies bounce around on a bed of house-infused beats until a Purdie-inspired drum break gives some breathing room for more dubbed-out flourishes to shimmer and sparkle. This 7" has been going fast and already appears to be sold out on Juno. A quick google search may yield some results...happy hunting! Super stoked to have these activated tunes hitting the floor..